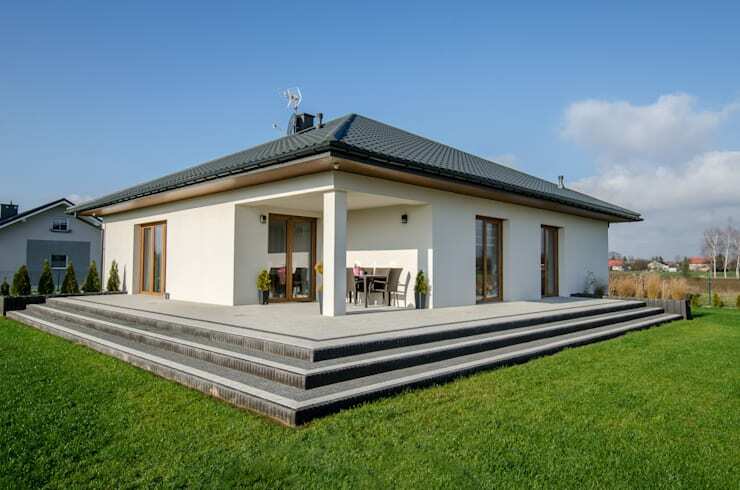 Designed by Polish architects Biuro Projektowe Mtm Styl, today's homify 360 is a gorgeous example of how a small, modern home can work perfectly on a large plot of land—as if you are in the country! We are going to see how each room transforms into an interior delight thanks to little touches here and there. Each room in this home has soul and character, thanks to the attention to detail that the designers have created. So forget your worries today and follow us on an aesthetically pleasing tour that will leave your fingers tingling with anticipation—you'll be so inspired you'll want to make some changes to your home today! If we look at the home from the get go, we can see that the designers have created a modest and subtly sophisticated home. While they have a large plot of land to work with, they've instead opted for a home that is smaller and more compact. 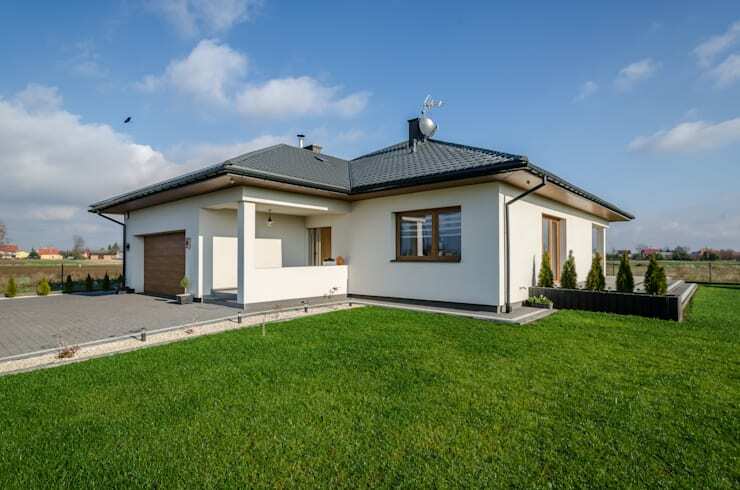 This leaves room for a large driveway and parking area for cars as well as an expansive (and manicured lawn). The landscape around this home is beautiful! 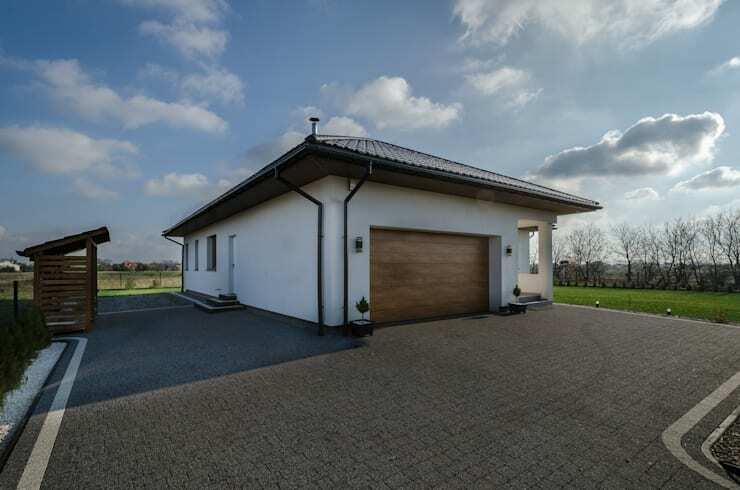 Look at how neat this home is from the outside, with its white walls, black roof and wooden garage. 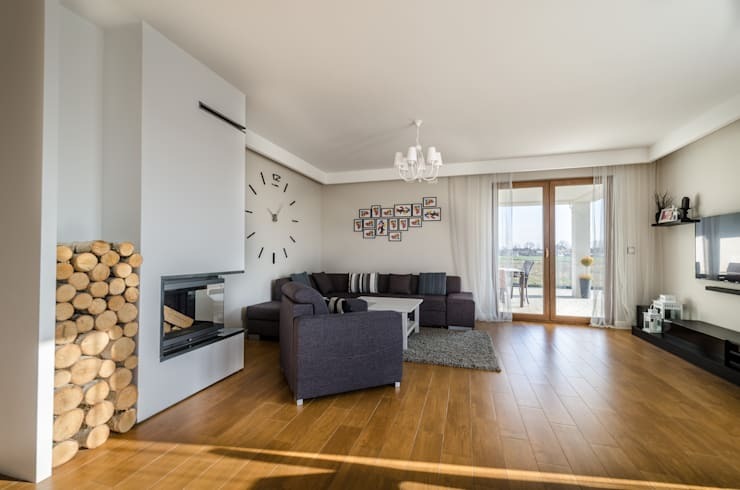 A garage is a wonderful addition to any family home as it allows for all of the bits and bobs, such as cars, bikes and scooters, to be stored neatly away behind a stylish door. It also protects your vehicles from the weather. How can you enjoy your home and the wonderful landscapes surrounding it if you don't have a fabulous patio? In this design, the patio is very subtle and savvy with enough space to enjoy a simple meal or read a good book while sitting outside. There is also a roof and ceiling extended over the patio so that there is shelter, not just for those sitting there but for the furniture too. This will ensure that the furniture lasts much longer than it would if exposed to the sun and the rain. Put a little dining room table and chairs or a comfortable sofa on your patio so that you can really utilise this space. A braai is also a great addition! Have a look at these: Tips on how to achieve patio perfection. If we head inside, to the living room, we can see that the designers have pulled the look and feel together in perfect harmony. The wooden floors contrast beautifully with the 50 shades of grey used throughout this room! Don't you love the pale grey walls, the darker grey rug and the even darker grey sofas? The designers have also opted for wall art here, creating a gorgeous and bold clock design on the wall above the sofa. This is striking and works wonderfully when juxtaposed with the photograph collage, which is done in a simple black and white. The fireplace is also a wonderful addition the home, creating that cosy, country bumpkin ambiance, especially in winter. Fireplaces are also easy to install and can be a fabulous decorative element. Have a look through the homify fireplace products for inspiration! The living room opens up onto the dining room, which opens up onto the kitchen. 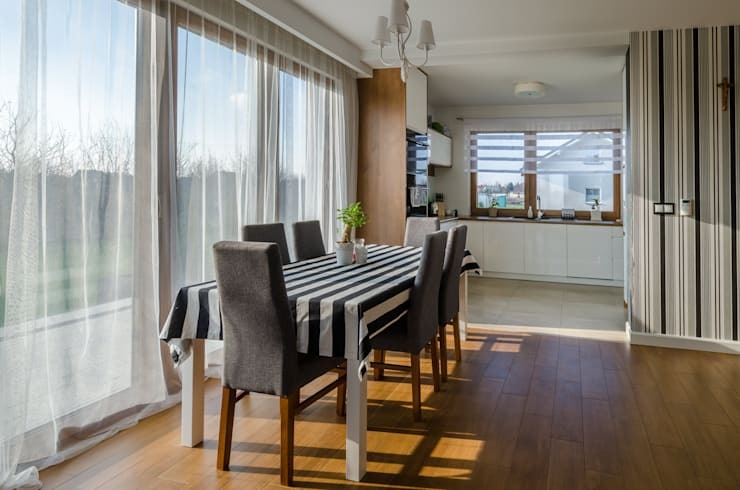 Open plan is wonderful for a family home, especially if it is not the largest family home. Open plan makes it seem much bigger and more spacious! The dining room chairs are also grey, while the kitchen is a lovely, neutral white colour. These are very subtle, warm and earthy tones. Don't you love the large glass windows and doors which allow an abundance of light to fill this home up? This is a great tip for any home! Install skylights, large windows or doors and you'll have yourself a very warm and welcoming space. Battling to find a place for windows or doors? Look at: Bright ideas that can cheer up rooms without windows. The designers have shown us here that colour truly has a place in interior design. 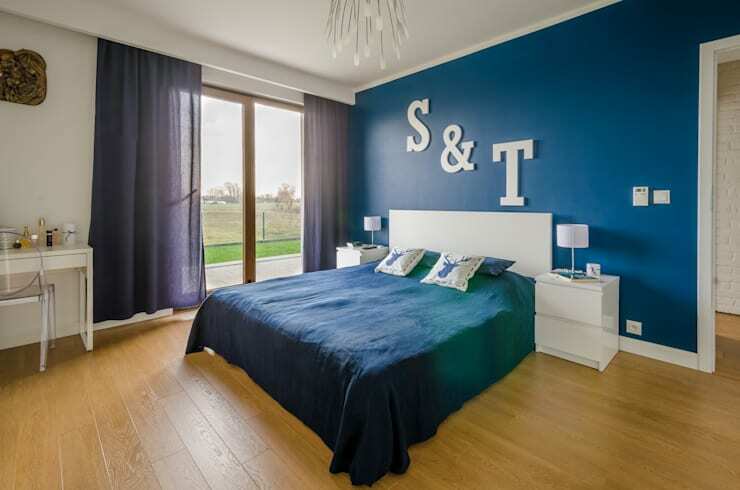 They have painted one of the walls in the bedroom a deep and bold blue, which works in harmony with the light wooden floors and white furniture. The blue linen and curtains add to the deep blue theme here, which creates a very soothing and calm ambiance. Don't you love the beautiful white initials that have been placed above the bed? This is romantic and adds a touch of the unique to the space. Besides these simple decor elements, the room is just functional and practical. This is a great tip for any room, you don't want it to end up looking cluttered and crowded. We end off our tour in the kids' bedroom where we can see how different themes work for different bedrooms. In this room, the designers have been less subtle, using turquoise throughout the room. This is a wonderful, cheerful and creative colour for a kid's bedroom. 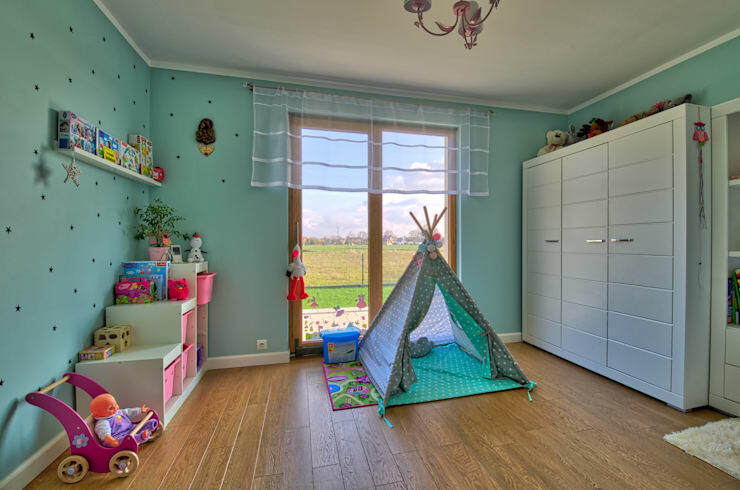 The shelving, toys, decor items and teepee all add a wonderful childhood charm to the room. Have a look at these: Amazing ideas for kids' bedrooms. This is a home where the designers have made a concerted effort from the outside in and look how far it goes! How can you improve your home with a few simple touches?